Three major domestic business organisations have urged Brussel’s visiting mission not to revoke Myanmar’s access to the Generalised Scheme of Preferences (GSP). Myanmar currently benefits from the EU’s Everything But Arms (EBA) scheme, part of the bloc’s GSP. But this could change. A high-level, emergency EU mission is currently in Myanmar to explore the possibility of revoking the country’s preferential trade status. The visit comes after EU Trade Commissioner Cecilia Malmström on October 3 announced that the bloc was considering ending Myanmar’s trade privileges due to human rights violations in northern Rakhine. Yesterday, the Union of Myanmar Federation of Chambers of Commerce and Industry (UMFCCI), Myanmar Rice Federation (MRF) and Myanmar Garment Manufacturers Association (MGMA) asked Brussels not to take away the trade privileges during a meeting with the monitoring mission, which included Director of Trade Helena König and EU Ambassador Kristian Schmidt. The business groups warned that removal of the EBA trade benefit will have negative consequences. According to the UMFCCI, businesses in the rice, garment and footwear industries made a plea to Brussels to continue to provide Myanmar access to the arrangement. U Ye Min Aung, UMFCCI vice chair, told The Myanmar Times that Myanmar could not compete with other countries without the EBA arrangements. The trade privileges are essential for Myanmar’s economic development and the survival of domestic small and medium-sized enterprises (SMEs). “If the EU halts the GSP and EBA for Myanmar, there will be an enormous impact on trade and foreign investments in the country,” he said, urging the Myanmar government to prioritise the issue in talks with Brussels. On the European front, six European trade promotion organisations said in a joint statement that they were “deeply concerned” at the possibility of the GSP withdrawal. With 93pc of the 400,000 workers being women, the garment sector is “a good platform” to bring forth change and promote European business values of labour rights considerations, gender equality and occupational safety. “It is by no means an exaggeration to suggest that damaging such an integral female-dominated industry is likely to hinder efforts for female empowerment and education in Myanmar,” it said. The statement also said the presence of European businesses in the country champions gender equality, transparency, accountability as well as social and environmental responsibility, and European companies work closely with the International Labour Organisation to promote core human and labour rights. With the threat of GSP revocation, European investors are alarmed and have begun to re-adjust investment plans in preparation. As a consequence, FDI in the country “will undoubtedly decline” in the wake of GSP revocation. The statement was signed by Germany’s AHK Myanmar, British Chamber of Commerce Myanmar, Italy Myanmar Chamber of Commerce (IMYBC), CCI France Myanmar, European Chamber of Commerce in Myanmar and German Myanmar Business Chamber. In 2013, the EU reinstated GSP for Myanmar as a means to provide political, economic and social support to help the country move towards democracy. Thus, Myanmar benefits from the EU’s EBA scheme, part of the EU’s GSP. The bloc is currently the sixth biggest trading partner for Myanmar. Total trade between the two partners equalled €2.09 billion in 2017. The EU, Myanmar’s sixth biggest trade partner, imported goods worth €1,549 million from Myanmar and exported goods worth almost €539 million to frontier market. EU imports from Myanmar are dominated by garments (72pc) and agricultural products. 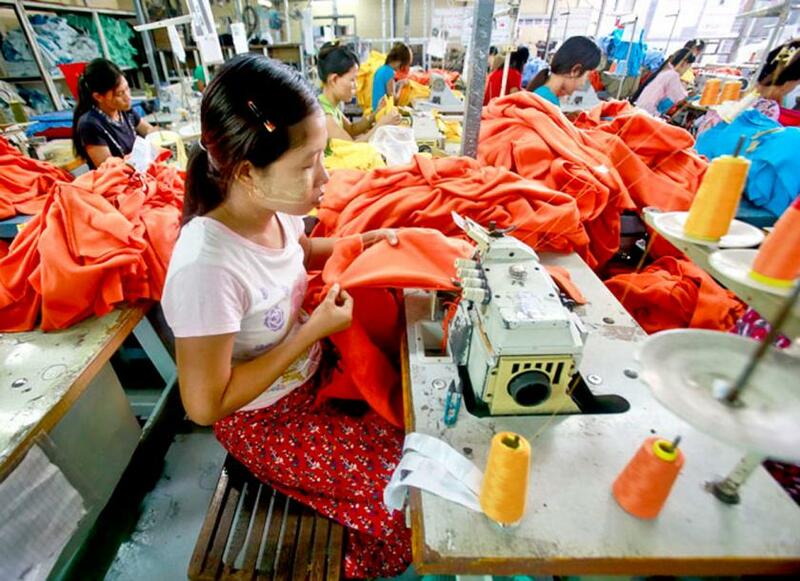 Europe’s single market accounted for 47pc of Myanmar’s garment exports in 2017, more than the next two biggest markets – Japan and South Korea – combined. In the first half of this year, the EU accounted for 55pc of overall garment exports, amounting to US$1.8 million. The market share is predicted to reach 60pc next year.